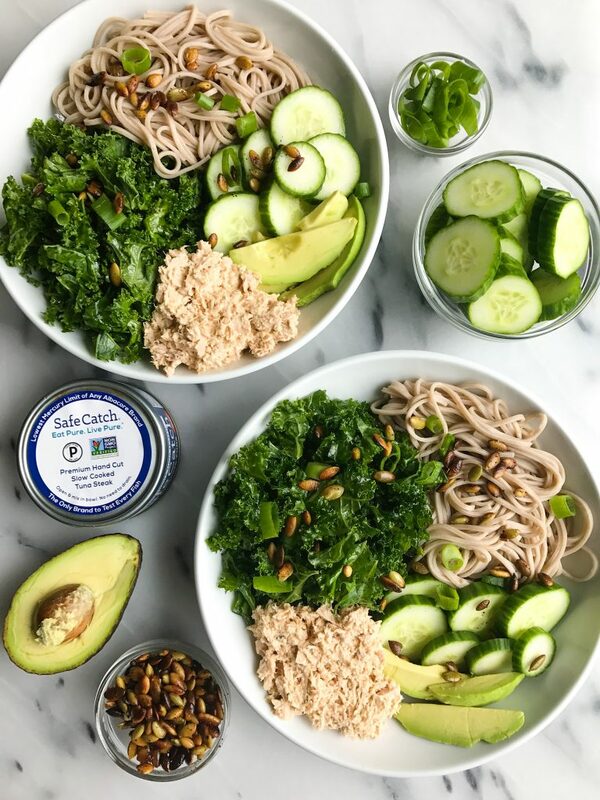 My Go-To Super Simple Tuna Salad Noodle Bowl for a quick and easy meal! The past couple weeks have been filled with delicious savory meal recipes for you babes. Last week we made Sweet Potato Chickpea Cake Buddha Bowls, Vegetarian Taco Bowls and Hummus Stuffed Burgers.. just to name a few. Many of you ask for easy lunch recipes that you can being to school and/or work though that you can prep ahead. I used to get so uninspired to make glorious lunches everyday when I was commuting to an office too. AKA I used to eat PB&J basically 5 days a week and switch up the nut butter to add some diversity to my lunch, ha! 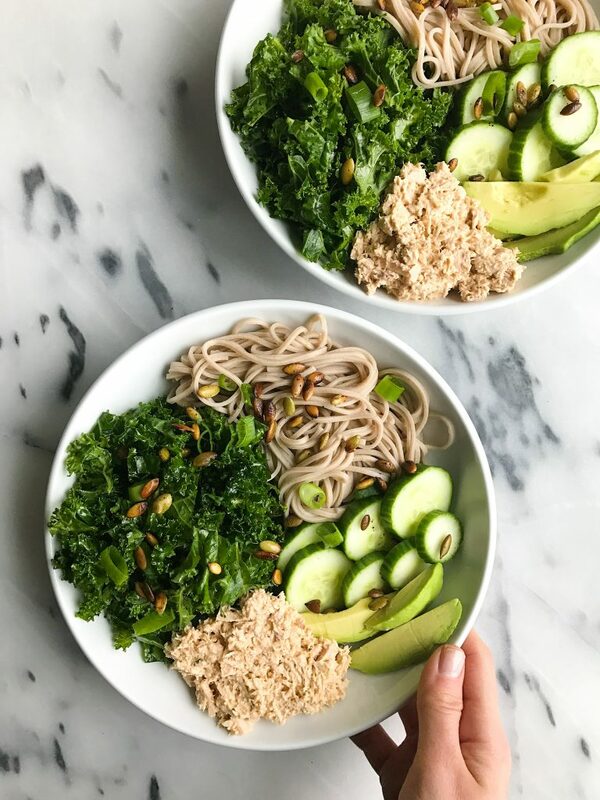 This Tuna Noodle Bowl, is such an easy lunch idea that takes minimal prep work and you can make it ahead of time the night before work or even 10 minutes before you want to eat it. It is so simple! Most of us think of canned tuna over a green salad or sandwiched between bread. And while those are both obviously delicious, it can be get boring. 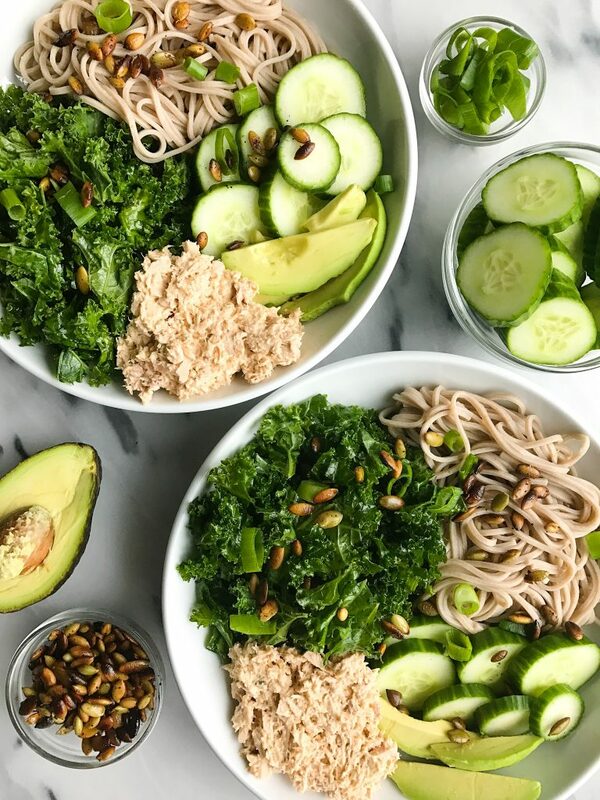 This is my go-to tuna noodle bowl that is super simple, flavorful and satisfying. Jord and I easily eat tuna a few days a week thanks to Safe Catch and their amazing canned tuna. It is the lowest mercury of any brand. It is safe for anyone to eat (even when pregnant! ), and their tuna is hand cut and packed and slow-cooked to complete perfection. It isn’t precooked and re-hydrated similar to most tuna cans you see in the market. Safe Catch tuna is filled with omega-3’s and it has 35g a protein a can, HELLO amazing. Safe Catch adds the perfect protein boost to this noodle bowl to satisfy you for lunch and fuel you for the afternoon. Plus it is filled with greens, carbs and healthy fats. *Can be made up to a few days in advanced but don't add avocado until ready to eat! Wow the safe catch tuna sounds like it would be really tasty! And I would probably do PB&J every day if I didn’t have foodie friends inspiring me to do new things every day.